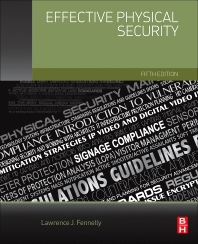 Effective Physical Security, Fifth Edition is a best-practices compendium that details the essential elements and latest developments in physical security protection. This new edition is completely updated, with new chapters carefully selected from the author’s work that set the standard. This book contains important coverage of environmental design, security surveys, locks, lighting, and CCTV, the latest ISO standards for risk assessment and risk management, physical security planning, network systems infrastructure, and environmental design. Should Marijuana be Legal for Medicinal and/or Recreational Purposes? Lawrence J. Fennelly is an internationally recognized authority on crime prevention, security planning and analysis, and on the study of how environmental factors (CPTED), physical hardware, alarms, lighting, site design, management practices, litigation consultants, security policies and procedures, and guard management contribute to criminal victimization. Mr. Fennelly was previously employed with Apollo Security, Computershare, Inc., as well as a sergeant at Harvard College, employed by the Harvard University Police Department in Cambridge, Massachusetts. He was trained as a crime prevention specialist and served in this capacity for over 21 years at Harvard. He was also the department’s training officer and assistant court officer. As part of his role as an officer at Harvard, Larry also was a deputy sheriff in both Suffolk and Middlesex counties (Massachusetts). Mr. Fennelly is a frequent speaker and lecturer on CPTED, physical security, school crime, and other issues. He serves as an expert witness who works closely with attorneys in defense as well as plaintiff cases, assisting in case preparation, offering knowledgeable questions to ask the opposing side, etc. He has also done a considerable amount of consultant work throughout the United States. His experience ranges from identifying vulnerabilities to conducting security and lighting surveys, working with architects to design and implement security, and developing long range guard training programs and risk assessments of various facilities. He is also a prolific author. His titles include such well-known security books as "Crime Prevention Through Environmental Design," "Effective Physical Security," and "Handbook of Loss Prevention and Crime Prevention." Expert witness and consultant in security, Litigation Consultants Inc.